After Sunday night, Amazon.com Inc. (Nasdaq: AMZN) can add “Oscar-winning” to its growing list of accomplishments. Amazon Studios walked away with three Academy Awards, snagging Oscars for best original screenplay and best actor (Casey Affleck) in Manchester by the Sea, as well as best foreign language film for The Salesman. Amazon’s win overshadowed competitor Netflix’s solitary win for best documentary short subject with The White Helmets. With Amazon topping online retail sales, challenging Wal-Mart for the lead in overall retail sales and now breaking into Hollywood in style, it seems no market is immune to the company’s amazing advances. 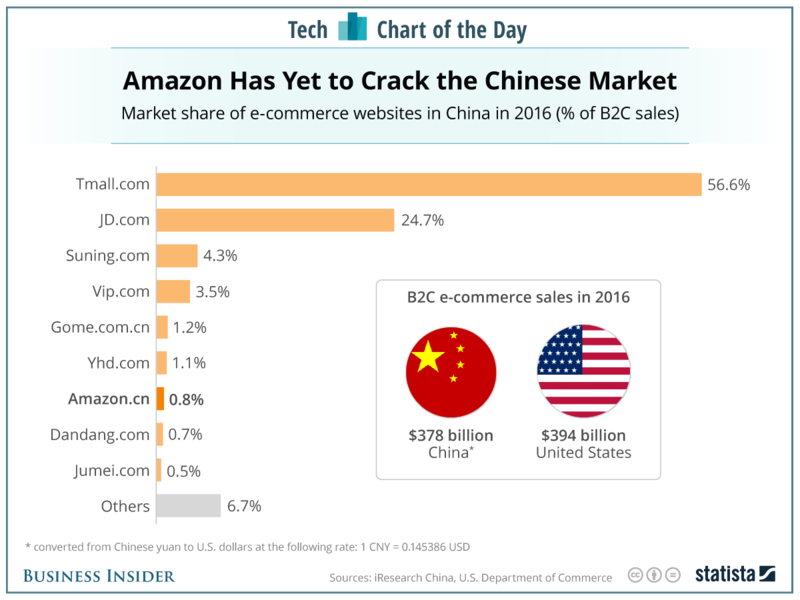 As you can see from the chart, Amazon has been unable to make any significant headway in China, eking out a barely mentionable market share of 0.8%. Though, as Business Insider notes, it’s not for lack of trying. Amazon bought Joyo in 2004 and rebranded it as Amazon China in 2011. The company also offered a limited version of Prime in China last year. Fortunately for Amazon, even retail-leading Wal-Mart has had to buy its way into China, snapping up a 12% stake in JD.com. But the problem of making any serious headway in Chinese online retail remains. And with $378 billion in online retail sales last year, it’s a market that Amazon needs to break into. Until it gets that big break, however, Amazon has set its sights on another up-and-coming market: India. Next »What Was Warren Buffett Thinking?